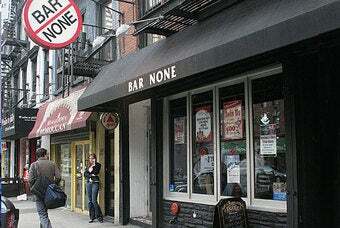 When Viking fans in New York City want to watch Vikings games, they go to a place called Bar None. When Saints fans in New York City want to watch Saints games, they go to the exact same bar. Uh-oh. Yes, Bar None is a sizable drinking establishment on Third Avenue in Manhattan with two large rooms equipped for watching football and being loud. The front room belongs to Vikes. The back room belongs to the Saints. (And their amazing homemade jambalaya. Seriously, it's to die for.) There are occasional "disagreements," but never have they faced one quite like the upcoming NFC Championship Game. The only upset will be if the game doesn't end with an arson. There are intense negotiations going on this week between the fan clubs and the bar. Who will get in? How will they enter? Knives or chains? The Saints group has even offered to wager the bar itself as the ultimate spoil to the victor. Lose and you're banished forever. Now that's gambling! In case you're considering it, non-regulars should not even bother going down there to watch the big game. VIP lists and doorman will attempt to maintain order this weekend. If you want to watch overweight drunks kick each other into the gutter, however, you should definitely pack a lunch.